Paxton's Tower is a Neo-Gothic folly erected in honour of Lord Nelson. It is situated on a hilltop near Llanarthney in the Towy Valley, Carmarthenshire, Wales. It is a visitor attraction that can be combined with a visit to the nearby National Botanic Garden of Wales. Its hilltop location provides views over the Botanic Gardens and the Towy valley. The tower is under care of the National Trust for Places of Historic Interest or Natural Beauty and is a grade II* listed building. The tower was built by Sir William Paxton (1745-1824), a Scottish-born but London-raised merchant and banker, whose forefathers were from Auchencrow by Paxton, Berwickshire. Paxton made his first fortune while with the HEIC in Calcutta with Charles Cockerell, brother of the architect. He purchased the Middleton Hall estate about 1790 and built the tower circa 1806-1809. Designed by the architect Samuel Pepys Cockerell (1754-1827), Middleton Hall was destroyed by fire in 1931. Paxton may have been inspired to build the tower by Nelson's death at Trafalgar. Whilst in the office of mayor of Carmarthen, he may have met Nelson in person. Marble tablets dedicating the tower to Nelson were located above the entrances to the tower. The tower is 36 feet high. The lower part of the tower is triangular in shape with a turret at each corner. On the first floor there is a banqueting room. Coloured glass from one of the windows can now be seen in the Carmarthen Museum at Abergwili. On the second floor there is a hexagonal prospect room surrounded by roof terraces. The windows to the prospect room are now bricked up. There is currently public access to the first floor banqueting room via stairs in one of the corner turrets. A piece of land at the nearby National Botanic Garden of Wales, named Paxton's View because of its views of the tower, features the sculpture Pi by Rawleigh Clay, which consists of a large metal hoop mounted by a twisted wooden structure. The hoop is designed so that it "frames" the view of Paxton's Tower, and as such has been described as a "viewing circle" for the tower. Dryslwyn Castle (Welsh: Castell y Dryslwyn) is a native Welsh castle, sited on a rocky hill roughly halfway between Llandeilo and Carmarthen in Wales. It stands on high ground overlooking the Tywi Valley with extensive views. It was built in about the 1220s by one of the princes of the kingdom of Deheubarth, and changed hands several times in the struggles between the Welsh and English over the ensuing centuries. It is considered one of the most important remaining structures built by a Welsh chieftain and is a Grade I listed building. Perched on the top of an isolated, rocky hill above the Towy Valley, Dryslwyn Castle occupies a splendid defensive position. It may occupy a spot previously used in as a fortification in prehistoric times but no evidence has been found to support this theory. In the twelfth century Rhys ap Gruffydd, often known as "Lord Rhys", reigned over the kingdom of Deheubarth and brought it a period of peace and stability. On his death in 1197, his three sons contested his inheritance and fought between themselves for supremacy. 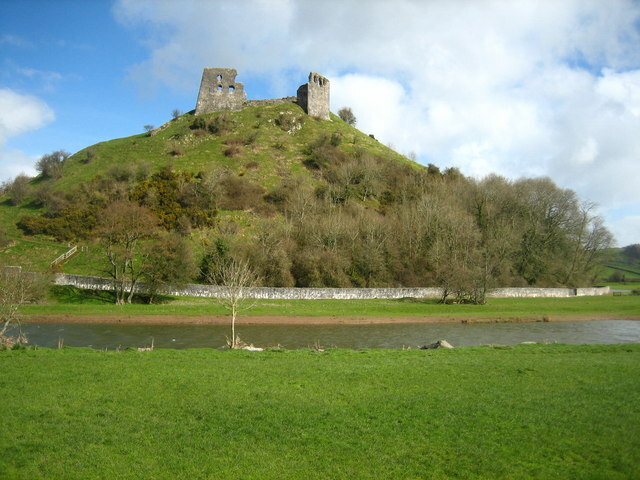 Neighbouring Welsh kingdoms and the English took advantage of this to infiltrate Deheubarth and it was around this time that Dryslwyn Castle was built. It is not clear precisely who built it, but it was probably constructed in the 1220s by one of the princes of Deheubarth, perhaps Rhys Gryg. In any event, the castle at Dryslwyn was, along with the neighbouring Dinefwr Castle, for a long time central to the security of the kingdom. It was apparently assaulted in 1246, because it was mentioned in an ancient chronicle Annales Cambrie, where a siege of the castle by the seneschal of Carmarthen was mentioned. He was apparently acting on behalf of its "rightful owner", but who that rightful owner was or whether the siege was successful is not known. It may have been that Rhys Gryg built the two fortresses of Dryslwyn and Dinefwr in order to provide legacies for his two sons after his death, which happened in 1234. The two castles are of very similar construction, with a round tower with flared base inside a ward enclosed by a curtain wall that contoured round the hillside. The ward contained a great hall and an adjoining building that was probably a kitchen. Between the hall and the curtain wall was an enclosed small structure that it has been suggested may have been a prison. The castle underwent a lengthy period of expansion in the late thirteenth century. After the death of the last native prince of Wales, Dafydd ap Gruffudd, in 1283, the castle was one of the few remaining substantial stone castles in Wales to be held by a Welshman; the most prominent surviving Welsh lord, Rhys ap Maredudd, continued to augment the castle's defences. He was allowed by the English to keep his castle as he had shown a more conciliatory attitude towards them than other Welsh lords. However, in 1287 he revolted against English rule, and the castle was besieged and captured after a three-week siege by the forces of King Edward I. The English troops numbered 11,000 and methods of assault included the use of a trebuchet and the undermining of the curtain walls. Several English knights were killed when one of the mine workings collapsed while they were inspecting it. Rhys's revolt petered out the following year, and Rhys himself was captured and executed in 1292. Dryslwyn was seized by Owain Glyndŵr in the summer of 1403 and when the English forces recaptured it, they decommissioned it by blocking various access routes, walling up the gatehouse, removing the treads from stone stairs and even removing the hinges from the main gate. At some later stage, all the major buildings were burned to the ground. Following this a lot of the stone was removed from the site. A ruined castle of limestone rubble walls. The chief upstanding remains are within the inner ward to the SW, which has a polygonal plan dictated by the shape of the hilltop. To the NE are more scant remains of the middle and outer wards. The original curtain wall of the early 13th century inner ward survives at no more than 1m high, while on the east side part of the curtain wall was remodelled in the late 13th century, and incorporates a garderobe reached up stone steps and with 2 shafts. At the NE corner is the remodelled gatehouse of the 13th century, in which steps to a wall walk have partially survived. The gatehouse survives at foundation level only, but the portcullis slot remains visible and the passage is cobbled. Attached on the south side of the gatehouse, and east side of the curtain wall, is the round tower, the original keep that occupies the highest ground. It was originally entered at first floor level from external steps built above a broad NW buttress. A doorway with segmental stone head, opening to the undercroft, is a later insertion. On the south side, directly overlooking the Tywi valley, is a projecting chapel on the east side. The chapel was at first-floor level where there are the remains of 3 lancet windows, and was entered below through a postern gate in the original curtain wall. On the west side is the battered wall, with return at the west end, of a former 2-storey apartment block, built outside the line of the original curtain wall. It has 2 pointed windows in the lower storey and the jamb and embrasure of a third, while in the upper storey a single similar opening survives with the jamb and embrasure of a second opening. Within the inner ward are the foundations of the original great hall and of Maredudd's mid 13th century hall at right angles on its east side. The original great hall survives at basement level and has a segmental-headed doorway in the north wall, with a former narrow window to its left, and in the centre the stone foundation of the hall fireplace. The outline of a small prison is on the north side of the great hall. Of the middle and outer walls there is only a small amount of masonry visible, mainly associated with the middle and outer gates. In the outer ward masonry of the NE gatehouse includes stone steps to a former wall walk. Little is left of the original structure and much of what is now visible has been revealed by excavation. A small portion of the middle and outer walls survive, mostly associated with the middle and outer gates. The best-preserved remains are within the inner ward, and here can be seen the polygonal plan that was adopted to fit in with the shape of the hilltop. It is considered one of the most important remaining structures built by a Welsh chieftain and is a Grade I listed building noteworthy as the only native Welsh castle to have three wards. Transport : Ffairfach (Heart of Wales) then bus (277). Bus Routes : 277 stops nearby. Opening Times Castle : Daily 10:00 to 16.00. The National Botanic Garden of Wales (Welsh: Gardd Fotaneg Genedlaethol Cymru) is situated near Llanarthney in the Towy Valley, Carmarthenshire, Wales. The garden is both a visitor attraction and a centre for botanical research and conservation, and features the world's largest single-span glasshouse measuring 110 m (360 feet) long by 60 m (200 feet) wide. The National Botanic Garden of Wales seeks "to develop a viable world-class national botanic garden dedicated to the research and conservation of biodiversity, lifelong learning and the enjoyment of the visitor." The Garden is a registered charity reliant upon funding from visitors, friends, grants and gifts. The Middleton family from Oswestry built a mansion here in the early 17th century. In 1789 Sir William Paxton bought the estate for £40,000 to create a water park. He used his great wealth to employ some of the finest creative minds of his day, including the eminent architect Samuel Pepys Cockerell, whom he commissioned to design and build a new Middleton Hall, turning the original one into a farm. The new Middleton Hall became ‘one of the most splendid mansions in South Wales’ which ‘far eclipsed the proudest of the Cambrian mansions in Asiatic pomp and splendour’. Paxton created an ingenious water park. Water flowed around the estate via a system of interconnecting lakes, ponds and streams linked by a network of dams, water sluices, bridges and cascades. Spring water was stored in elevated reservoirs that fed into a lead cistern on the mansion’s roof, allowing Paxton’s residence to enjoy piped running water and the very latest luxury, water closets. In 1806, Saxton engaged Pepys Cockerell again to design and then oversee the construction of Paxton's Tower on the estate, which was completed in 1809. 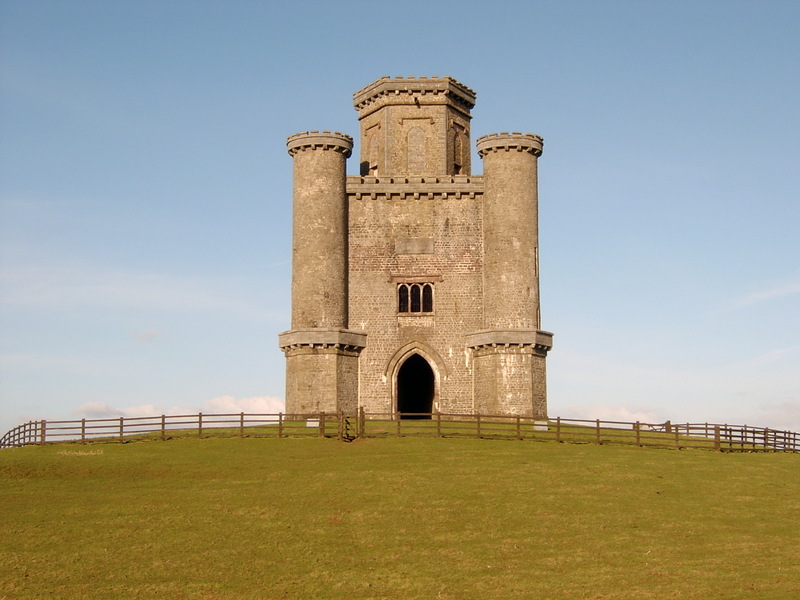 A Neo-Gothic folly erected in honour of Lord Nelson, it is situated on a hilltop near Llanarthney in the Towy Valley. Today the folly is now owned by the National Trust (see above). By the time of Paxton's death in 1824, Middleton Hall estate covered some 2,650 acres (1,070 ha). The sale agents engaged that year described the estate thus in their catalogue: “ Richly ornamented by nature, and greatly improved by art. A beautiful tower erected to the memory of the noble hero the late Lord Nelson, forming a grand and prominent feature in the Property and a Land Mark in the County, opposite to which are the Ruins of Dryslwyn Castle, and the Grongar Hills, with the Towey winding to a great extent, presenting a scenery that may vie with any County. As to local amenities, the Roads are excellent, a good Neighborhood, and Country abounding with highly Picturesque Scenery ”. Middleton Hall estate was sold to Jamaican-born West India merchant, Edward Hamlin Adams, for £54,700. Neither a gardener nor a lover of water features, while adding buildings that aided his love of country sports, the bath houses quickly fell into disrepair, and only the gardens immediately visible from the house were maintained. In 1842 the estate passed into the hands of his eccentric son Edward, who immediately changed his name from Adams into the Welsh form Abadam. Not loving the country or gardens, according to his estate manager Thomas Cooke, Edward was a social nightmare. As his son predeceased him, on his death in 1875 the estate passed to his daughter, who had married into the local Hughes family. In 1919 the estate changed hands again when Major William J. H. Hughes sold it to Colonel William N. Jones. In 1931, the mansion was completely gutted by fire, leaving only the walls standing, themselves covered in globules of moulten lead from the melted roof. After this the estate fell into decline, and 20 years later the walls of the main house were pulled down. The site was then bought by Carmarthenshire County Council, and leased to young farmers hoping to make their way into an agricultural career. In 1978, interest had been captured by local walkers, who were keen to revive the splendour of what they could see around them. Setting up a fund-raising scheme, the little money raised led to the rediscovery of a number of historical features. The idea for a National Botanic Garden of Wales originated from the Welsh artist, William Wilkins, whose aunt had described to him the ruins of the elaborate water features she had discovered while walking in the local woods at Pont Felin Gat. Under the guidance of the Welsh Historic Gardens Trust, an application was made to the Millennium Commission to fund Britain’s first national botanic garden for 200 years. Virtually on the site of Cockerell's mansion, the Great Glasshouse now forms the centrepiece. Much of the original water-scape has been restored, and extended by introducing cascades to the western approach to the Glasshouse. The extraordinary original view the east side of the mansion offered over the grounds has been restored, extending, as originally, to Paxton's Tower in the distance. Many experts have commented that this view gives visitors an ability to see and hence understand something of what the great landscape architects of the end of the eighteenth century understood by the word “Picturesque”. The Garden was opened to the public for the first time on 24 May 2000, and was officially opened on 21 July by the Prince of Wales. In 2003, the garden ran into serious financial difficulties, and in 2004 it accepted a financial package from the Welsh Assembly Government, Carmarthenshire County Council and the Millennium Commission to secure its future. The site extends to 568 acres (2.30 km2), and among the garden's rare and threatened plants is the whitebeam Sorbus leyana. 21st Century approaches to recycling and conservation have been used in the design of the centre: biomass recycling is used to provide heating for some of the facilities such as the visitor centre and glasshouses. Placed virtually on the same site as Paxton's new but now demolished Middleton Hall, the Great Glasshouse, designed by Foster and Partners, is the largest structure of its kind in the world. The structure is 95 m (312 feet) long and 55 m (180 feet) wide, with a roof containing 785 panes of glass. Housing plants from several Mediterranean climate regions, the plants are divided into sections from Chile, Western Australia, South Africa, California, the Canary Islands and the Mediterranean itself. The Double Walled Garden has been rebuilt from the ruins, and is being developed to house a wide variety of plants, including a modern interpretation of a kitchen garden in one quarter, and ornamental beds to display the classification and evolution of all flowering plant families in the other three quarters. 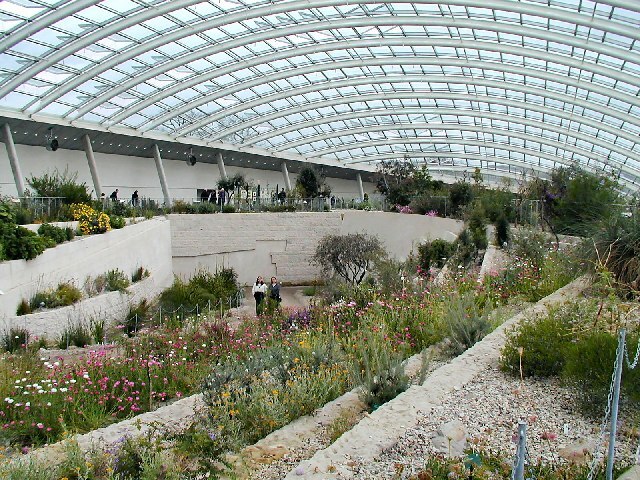 In 2007, a new Tropical Glasshouse, designed by Welsh architect John Belle, was opened to continue the classification displays with tropical monocotyledons. In 2015 a large collection of Welsh Apple varieties have been planted and a Welsh Pomona is forthcoming. The plant collections of the National Botanic Garden are many and varied fulfilling the primary objectives of the Garden to Inspire, Educate and Conserve. The plant collections are dynamic and provide visitors to the Garden with an ever changing palette. One of their primary objectives is to demonstrate all the many and varied ways that we rely on the plant kingdom for our survival and continued well-being. 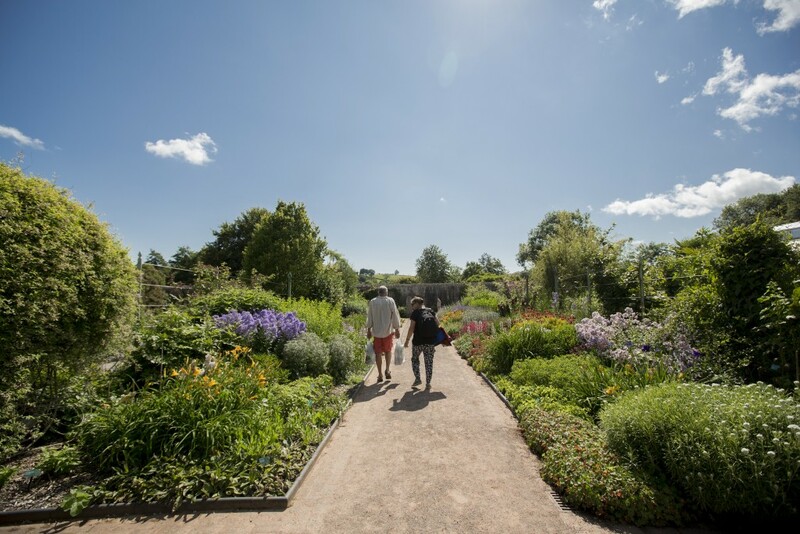 There is a voyage of discovery to be had around the Garden and the wider estate with its wide variety of land management, planting styles and displays showing the art, craft and science of horticulture in equal measure. This garden has recently been refreshed. During 2016, they were enriching the soil and redesigning the displays so that the Apothecary’s Garden will become one of the most fascinating and beautiful physic gardens in Britain. The renewed garden is themed on systems of the body – Reproduction, Digestion, Circulation, Respiration, Glandular (Endocrinal), Skin, Muscular/Skeletal, ENT (ear, nose, throat), Nervous System, Infection/Infestation and Cancer. In addition, an extended area, next to the Apothecary’s Hall, will explore the history and culture of medicinal plants. This is a fascinating area of the garden and we are sure you will be intrigued as well as enjoy the results of the refreshment. Apothecary’s Hall. This Edwardian pharmacy, packed full of medicinal memorabilia, is highly popular with visitors. A re-created Edwardian pharmacy where most medicines were made from plant materials and extracts. In the stone barn next to Millennium Square, you’ll find the Apothecary’s Hall, where you will see a range of ‘shop rounds’ containing tinctures, syrups and powders. These were chiefly used to produce pills, ointments and potions using the kind of mortars and balances that are on display. Compare the wide range of proprietary medicines, and their exaggerated claims, against the products of today. Those of you who have studied a bit of Latin might also be interested in a rare chance to read a real prescription book, written in Latin. Above the counter, you cannot miss the magic mirror. This unique look-back in time offers a series of short stories about an Edwardian apothecary and his apprentice. Each 3-4 minute vignette looks at different aspects of their work, with a Welsh language version following the spoken English version. Next to the Apothecary’s Hall is an exhibition about how plants have been used to treat illnesses across the world. When you come out of the exhibition, pop over to the Apothecary’s Garden next door where you can see many of the plants that are used to create pills and potions. Aqualab. A wonderful and inspiring place to learn about the natural world. Perched upon stilts above the edge of Pwll yr Ardd is a wooden building. Packed full of microscopes and study aids, this is the Aqualab. The Aqualab is a fascinating place where schoolchildren can get the opportunity to explore a treasure chest of natural wonders through a number of activities: •Day and evening courses bring in adults to make, identify and find out things. •Teachers come here to learn how to teach outdoors. •Families have fun making wonderful creations from plants during the school holidays. The Garden’s Education team runs the Aqualab. Designed by students of the Cardiff School of Architecture, it is heated by a water heat source pump. that uses the ambient heat of sub-surface water in Pwll yr Ardd. Bee Garden. Home to 250,000 honey bees, their Bee Garden is a abuzz with activity. 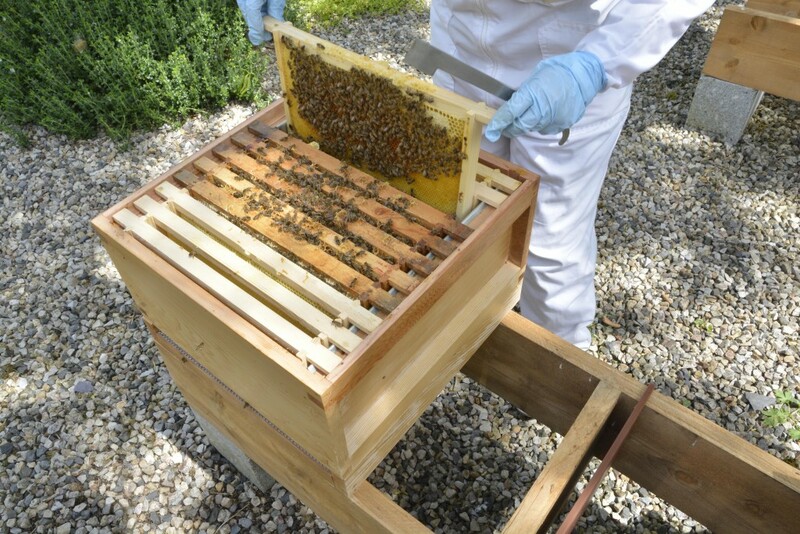 Get up close to the bees and hives behind large viewing windows. You can also watch a short film about life inside a hive and listen to stories about their bees, beekeeping and research carried out by Garden scientists on the honey made by their bees. They will also help you decide which plants to grow in your garden to attract pollinators via ther Pollination Trail. You can pick this up at the Bee Garden or any one of their model bee hives dotted in and around the Double Walled Garden. The Garden’s biomass boiler helps to warm the Great Glasshouse, offices, shops and catering facilities. The biomass boiler is a renewable energy source that currently burns factory waste chippings and shavings that would probably have ended up in a landfill site if they didn’t come here. The use of biomass in heating systems is beneficial because it uses agricultural, forest, urban and industrial residues and waste to produce heat and electricity with less effect on the environment than fossil fuels. This type of energy production has a limited long-term effect on the environment because the carbon in biomass is part of the natural carbon cycle; while the carbon in fossil fuels is not. Eventually they hope to use coppiced willow and poplar, which is being grown on an adjacent field. Boulder Garden. An aromatic terraced area studded with boulders and scree. The plants in the Boulder Garden complement the Mediterranean theme inside the Great Glasshouse. However, these warm climate loving plants are not sheltered by anything and would usually struggle to grow in Wales’s cool, damp climate. So gardeners have had to think very imaginatively. The stony soil of the Boulder Garden helps water to pass through quickly, reducing the chance of winter damage. This helps prevents frost damage to bulbous plant species native to Southern Europe, such as cyclamen, crocus and colchicum. The sunny south-facing slopes suit shrubs like cistus and juniper, whilst hellebores and euphorbias favour shade. Broadwalk. The 220m long avenue which divides the Garden is known as the Broadwalk. One of the longest herbaceous borders in Britain, from spring to winter, this Garden ‘spine’ is a blaze of colour. It begins at the Gatehouse, passes a water sculpture called Scaladaqua Tonda, then Circle of Decision, a fountain shaped like the cross section of an ammonite, and leads up to a beautiful pond that we call the Mirror Pool. This feeds water down into The Rill, a meandering stream that flows down the Broadwalk with a shape and course that is inspired by Carmarthenshire’s Towy Valley river. Along the east side of the Broadwalk you will also come across the Rock of Ages, a geological display spanning 300 million years of Welsh history. Butterfly House - Plas Pilipala. This hot and steamy glasshouse is alive with a kaleidoscope of colourful butterflies from across the tropical world. Highlights include: •Huge blue Amazonian morphos. •Great eggfly butterflies that swoop past palms and orchids. •Butterflies with see-through wings. •Butterflies that mimic the colours of poisonous bugs. •A butterfly feeding area (the Butterfly Café) where diners include the Postman, the Tree Nymph, Sara Longwing and Doris. •Special butterfly family activities throughout the school summer holidays. Plas Pilipala is the huge glasshouse inside the Double Walled Garden. The Tropical House was designed by world-renowned Welsh architect John Belle, celebrated for his restoration of some of the most famous landmarks in the USA including New York’s Grand Central Station Terminal & the National Museum of Immigration on Ellis Island. Dipping Ponds. They have three ponds where you can come and learn about freshwater life. Newts, pond skaters & water beetles share the water of the dipping ponds with bizarre microscopic life forms. Vicious dragonfly larvae lurk in the dark silty depths, hoping to feast on tadpoles, snails and water spiders. In some school holidays, they run pond dipping sessions for families, using nets, trays and microscopes. Check their What’s On page for times and dates. Spaces are limited and you will need to book your place at the Gatehouse entrance. They also offer pond dipping programmes for Foundation and Primary schoolchildren. Sorry – please don’t pond dip on your own. The Double Walled Garden displays the story of the evolution of flowering plants. It is divided into four quadrants, each with its own distinctive pathway. Quadrants 1, 2 and 3 tell the story of the evolution of flowering plants, and is based on the latest DNA and microscopic research. From primitive water lilies at the centre of the garden to the latest cultivars by the outer walls, you can travel though 150 million years of botanic history. Plants with one seed leaf, flowering parts in threes and sixes, and spear-shaped leaves with parallel lines are found in Quad 1 – these are known as monocots. There is a Tropical House in Quad 1 which is largely made up of monocots such as orchids, palms and bromeliads. Plants with two seed leaves and flowering parts in twos, fours and fives, are known as Eudicots and can be found in Quads 2 and 3. In Quadrant 4 you’ll find a modern kitchen garden, reflecting this area’s original use. Crops grown here are chosen for both their aesthetic qualities as much as their tastiness – you may well find them on your plate in their Season’s Restaurant. Along the wall from the Tropical House are the ruins of the early 19th century Peach House, which they hope to restore over the next few years. They have made a pollination trail to help you to explore and understand the Double Walled Garden. You can collect a trail sheet from a white beehive display box situated in and around the Double Walled Garden and outside the Bee Garden. Origins. The Double Walled Garden is a very unusual feature of Welsh and English gardens but is more commonly found in Scotland. The stone outer and brick interior walls create a series of different microclimates and it is thought that this extended the growing seasons. When it was built 200 years ago, the Double Walled Garden, at over three acres, could provide enough fresh fruit and vegetables for a household of 30 people, and employed 12 full- time gardeners. The two walls – one brick, one stone – provided shelter from animals and the harsher elements, and created important microclimates where tender plants could grow. This enabled Sir William Paxton’s gardeners to extend the growing season and, in an era when the transport of fresh produce was very slow, allowed Paxton to impress his guests with a harvest of unseasonably early strawberries, or fresh peaches cropped long after the main season was over. Within the walls were four primary paths, a central dipping pool to provide handy water for gardeners and a lean-to glasshouse (now a ruin) described as a ‘Peach House’ in an 1824 sales document. This was an enclosed building where, using a Roman-style under-floor heating system, peach trees and other soft fruit were grown all year round. The slip gardens between the brick and stone walls may have been used to grow a range of soft fruits and perhaps to hide unsightly objects like gardening tools and manure. Fungi Exhibition. From Another Kingdom is the first major exhibition in the UK to focus on the fascinating world of fungi. This interactive exhibition reveals the intimate details of fungi in a way they have never been shown before, challenging misconceptions and showing how they are vital to the survival of life on earth. The touring exhibition, from Royal Botanic Garden Edinburgh, is in the display area of the Great Glasshouse. This has been transformed into a labyrinth of themed spaces where visitors will come face-to-face with fungal diversity, myths and magic and the role that fungi play in eco-systems and recycling. Highlights include a forest of super-sized toadstools, glow-in-the-dark mushrooms and a version of Russian roulette involving deadly poisonous fungi.A new addition, created in 2015, is a hand-stitched display of over 50 Welsh fungi, created by the Garden’s Stitching B group. Garden Lakes. A beautiful necklace of garden lakes creates a gentle transition from the formal to the informal parts of the Garden. It also provides an important habitat for aquatic flora and fauna. 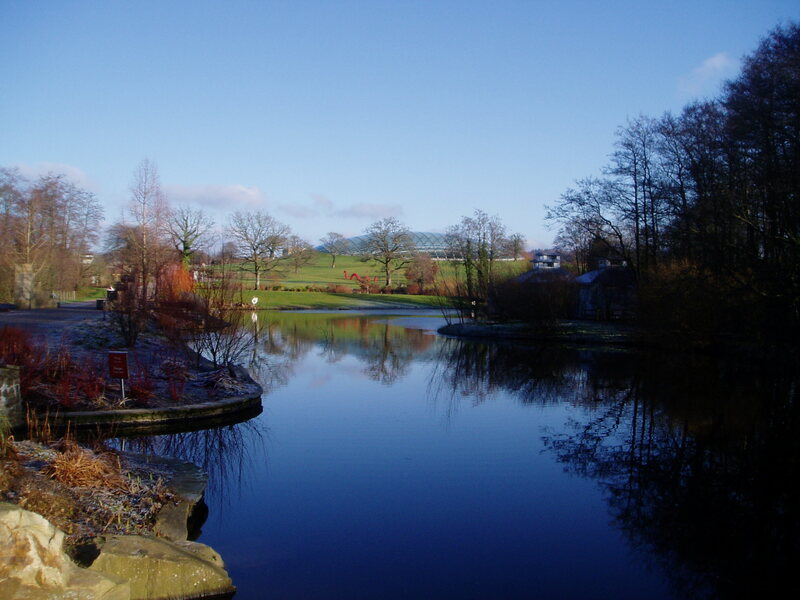 The Garden Lakes water features were created by William Paxton, the landowner who transformed the original 17th century Middleton Estate into a Regency water park. His ingenious system of lakes, streams, ponds and cascades were formed using dams, bridges and sluices. These not only added beauty to the park but were also designed to provide a state-of-the-art water supply for his new Middleton Hall. Over time the lakes gradually turned into muddy thickets, so choked with trees that it was hard to believe they had once held clear water. Now, one by one, the seven lakes are being restored – first Pwll yr Ardd (Garden Pool), then the bridge and weir that retain Llyn Uchaf (Upper Lake), and Llyn Canol (Middle Lake). With the help of a Heritage Lottery Fund grant to restore their Regency landscape, they are planning to restore the other lakes by 2020. A lovely path takes you past the lakes, each now abuzz with colourful and busy wildlife. Especially lucky visitors may come across otters and kingfishers. The damp soil conditions around the water’s edge are also ideal for perennials like winter aconite, hellebores, primulas, irises, astilibes, gunnera and the skunk cabbage, whilst water lilies flourish on the lake surface of Llyn Uchaf. Ghost Forest. This display of tropical tree roots is one of the most significant environmental art installations to come to Wales. The Ghost Forest has come from the tropical rainforests of Ghana – that’s about 3000 miles south of here. The oldest tree root is 300 years old, the heaviest weighs 19 tonnes. They are the inspiration of UK based artist Angela Palmer. She was horrified to learn that a tropical forest the size of a rugby pitch is destroyed every four seconds. Just think how much is lost every minute, every hour, every year. Apart from the huge loss of species, rainforest loss is contributing to climate change. She made world ambassadors out of these tree roots. She chose Ghana as it now sustainably manages its rainforests. She brought the tree roots to Trafalgar Square, to the Earth Summit in Copenhagen, to Oxford University and now here, their final resting place. They invite you to touch, smell, hug or draw them or whatever inspires you to get to know these environmental ambassadors. Great Glasshouse. This spectacular dome is the largest single-span great glasshouse in the world. Designed by Norman Foster and Partners, the Great Glasshouse is poised on the Welsh landscape like a giant raindrop. It houses some of the most endangered plants on the planet which come from six areas of the world: California, Australia, the Canary Islands, Chile, South Africa, the Mediterranean Basin. Each of these geographical areas has regions that enjoy a Mediterranean climate. Hot dry summers, cool moist winters, dazzling sunlight, strong breezes and the occasional ground-clearing fire, create perfect conditions for many plants to thrive on the scrubby, rock-strewn landscapes. Although these regions cover less than 2% of the Earth’s surface, they contain more than 20% of all known flowering plant species, and their richness and plant diversity are considered second only in importance to tropical rainforests. Sadly, these plants are under serious threat from modern human developments in agriculture, tourism, housing and increasingly, climate change. At first glance, it is not obvious that the plants in the Great Glasshouse come from six different places in the world. This is because they often share many qualities, such as small leathery evergreen leaves and dense shrubby forms, having adapted in similar ways to the similar environmental pressures they face. Kathryn Gustafson designed the imaginative flowing landscape inside the Great Glasshouse on which these plants thrive. Covering 3,500 square metres, its rocky terraces, sandstone cliffs and gravelled scree slopes are contoured to reflect the natural environment and to create a wide range of habitats, balancing light and shade and varying moisture levels to suit the needs of different plants. Ice House. Walking up the lower Broadwalk, you may have noticed a small stone arch embedded in the hillside to your left. This is an ice house which was built at the end of the 18th century to service Middleton Hall. William Paxton’s servants used the ice house as a fridge. They stored ice here, taking it out to make sorbets and to chill Middleton Hall’s larders where they stored vegetables cropped from the Double Walled Garden and meats from the estate. Whilst some ice may have been collected from frozen lakes, most probably came from iceberg sourced ice brought into and sold in Swansea. The ice house is approached along a barrel vaulted brick passage originally sealed by three wooden doors. At the far end a lower vaulted passage leads at right angles to the ice chamber, that is partly sunk into the hillside and lined with brick.The chamber itself is around 3m deep and the total interior height from the funnel shaped domed roof is around 5m. In the brick floor of the chamber is a circular basin with an adjoining drain originally covered with a stone slab. Meltwater probably filled the basin before overflowing into the drain. Both the ice chamber and the passage have an outer shell of brick, but unlike some ice houses there is no insulating gap between the layers. Clay was piled around the outside of the passage and the chamber to increase insulation. Mill owners were not always men. There are records of three women mill owners in Wales in 1840, Mary Powell with 16 looms and 8 men, Ann Harris with 14 employees including 6 men, and Ann Whiled with 9 employees. Large spinning mills continued to operate in Llangollen in the north throughout the 19th century. For example, the Trefriw Woollen Mills, originally called the Vale of Conwy Woollen Mill, was built in 1820 on the banks of the Afon Crafnant. Thomas Williams purchased the mill in 1859 and expanded the business. Products from the woollen mills were taken to the coast from the quay at Trefiw using the River Conwy. A 36 feet (11 m) diameter overshot wheel powered spinning mules and jennies. The yarn was then woven into cloth on hand looms. A smaller 7 feet (2.1 m) wheel powered a fulling mill, which washed the cloth and kneaded it with wooden hammers to thicken and strengthen it. The mill was still in operation (in a newer building) as of 2016. Japanese Garden. The Japanese Garden is a miniature world with mountains, forests, lakes and oceans. It is named Sui Ou Tei, a reflection of the national flowers of Japan and Wales – the cherry tree and daffodil. The Real Japanese Garden was brought here piece by piece from the Chelsea 2001 Flower Show where it won a gold medal and the prestigious ‘Best of Show’ Award. It consists of three traditional Japanese gardens – the Stream and Lake Garden, the Gravel Garden and the Tea Garden. Filled with symbolism and guided by Zen philosophy, this is a lovely place to sit and contemplate. The Garden was designed by Professor Masao Fukuhara, a lecturer in design at Osaka University. The Professor and his team came to Wales to supervise the installation of the Japanese Garden alongside Wolfgang Bopp and his team of horticulturists and volunteers. It can be seen alongside the southern wall of the Double Walled Garden. In building the Real Japanese Garden, Professor Fukuhara hand-picked the natural materials he needed to recreate scaled-down Japanese scenery and areas of peace and harmony within the 568-acre Garden of Wales. The Professor listened to the “voice” of each stone and placed it precisely within the design according to its character and sexuality. Each element of the Garden is symbolic – an area of white gravel stones represents the sea, larger stones are small islands and waterfalls. The Water Feature is an encapsulation of a Japanese landscape representing mountains, mountain stream and lake. The Tea House or ‘lori’ is also an important component. Rock of Ages. A unique display of Welsh geology spanning 300 million years of history. Here, you get the chance to touch the imprints of creatures that died over 400 million years ago, to see the remains of giant tropical forests that once covered South Wales and to wowed by the after-effects of massive volcanic explosions that once rocked the undersea world of Wales. You’ll also find out why over 70 species of lichen have colonised this unique display of Welsh geology. Stable Block. The Stable Block is the beating heart of the Garden. It houses their Seasons Restaurant, Gift Shop, Oriel Yr Ardd Gallery, reception area and offices. But 200 years ago, the Stable Block was home to twenty-two carriage and riding horses, two large coach houses, a harness room, lofts and rooms for coachmen and stable boys. Each pen had a wooden plaque stating the horse’s name, height, birth date and parentage. When these horses died they were given honourable burials. Doves were also kept here, in the spaces within the brickwork, but now it is home to nesting house martins, who often like to hang out with the visitors inside the restaurant. Welsh Country Walk. Experience the delights of a traditionally managed hay meadow and wander down an old country lane. The hay meadow on the Welsh Country Walk, known as Trawscoed North, has blossomed with an array of wildflowers since they started cutting the hay just once a year in the late 1990s. Like farmers would have done for hundreds, if not thousands, of years, they only cut the meadow once the wildflowers have had time to flower and set seed. So from May through to August you get the chance to see waves of wildflowers including four varieties of orchid as well as many other flowers which have become rare in our countryside – since the 1930s, Britain has lost over 98% of its wildflower-rich meadows. Keep an eye open for the rich variety of bird, bee and butterfly life here too. The walk is about 1km long and forms part of a network of footpaths that weave around Waun Las NNR. Stout footwear is recommended. The Welsh Country Walk is less than 5 minutes walk away from the Stable Block. Woods of the World. Across the planet, there are woodlands that grow in the same climate as that found in Wales – in Tasmania, south west China and the Himilayas, parts of Chile and the northern seaboards of the USA. We want to re-create these semi-natural woodlands on the hillside overlooking Llyn Uchaf. Planting has begun on trees and shrubs, and eventually ground flora from these regions will be added. All the plants from the dominant tree species down through the shrub layer to the herbaceous plants that would be normally found in association with each other in these countries will be brought together and grown in as naturalistic a manner as possible. But they don’t expect the area to mature for a generation. In the meantime, every time you visit have a little look to see how quickly, or slowly, it is maturing. You’ll also see Welsh native trees planted alongside Woods of the World. These form part of our Jubilee Woods, planted in 2013 in honour of Queen Elizabeth II’s 60th anniversary celebrations. They have opened up a couple of paths to let you see what has been achieved so far. Just follow the colour-coded stake posts and wear stout footwear as it can be a bit rough and wet in places. Y Pot Blodyn (the Flower Pot in English) can be found next to their Gatehouse visitor entrance. Here they sell a wide range of plants, some of which are grown locally and you might not find in other garden centres. The Garden Plant Shop also sells gardening gifts, pots and plants, from the ordinary to the exotic. The Coffee Shop, located in Y Pot Blodyn, is a lovely place to come and relax whilst enjoying the taste of Wales with their locally made and sourced light food and drinks. There’s also the chance to buy Welsh made produce such as laverbread, jams, cheeses & cakes. Y Pot Blodyn doesn’t need an admission fee, so that anyone can drop in without having to pay to visit the whole Garden. The Garden has been designed to be accessible to all visitors whatever their ability. All paths within the formal Garden area are wheelchair friendly and there are several manual wheelchairs available at the Gatehouse. They also have several mobility scooters available to hire from the Gatehouse at £6 each. Due to popular demand, it is advisable to call 01558 667149 before your visit to book one of these. As a charity, they appreciate donations of manual wheelchairs so, if you can help them, please ring the same number. They also have a regular shuttle buggy service to take you to most parts of the Garden and return you to the Gatehouse. their buggy drivers will also be happy to answer any questions you have about your visit. No pets are allowed into the Garden except guide dogs. For the safety of all their visitors, they do not allow bicycles or skateboards. Carers are Free. Transport : Carmarthen (National Rail) then bus (279). Bus Routes : 279 stops here (not Fridays or Sundays). Opening Times Botanic Garden : April through October, Daily 10:00 to 18.00; November to March 10:00 to 16:30.